Someone told me about this project at a New Year's gathering in KC. The funny part is how I did the whole thing with minimal calculations, although I 'd do it a little different next time. If you can't tell from the pic, I made a tiered skirt that is sewn to the bottom of a tshirt to form a dress. It took less than 2 hours to make, and was very simple to construct. 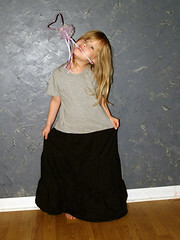 It is floor length on Pari, so I should have taken about 3 inches out of the shirt bottom to make it a little shorter. But she loves it, and it's a good way to dispose of scrap fabric and to make tshirts into dresses. I did the same thing years ago when my girls were little.